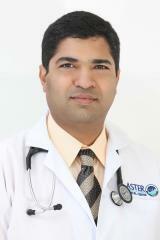 Dr. Vijay Anand is working as a Specialist Gastroenterologist in Aster Clinic, Al Qusais. Dr. Vijay Anand V has completed MBBS from Govt. Medical College, Thrissur, MD from Govt. Medical college, Madurai and DM in gastroenterology from Govt. Med college, Thiruvananthapuram. He has undergone training in hepatology (liver diseases) at Mount Sinai School of Medicine New York. He has 9 years of experience as Gastroenterologist and has previously worked as specialist Gastroenterologist in Zulekha hospital Dubai and as consultant Gastroenterologist in Malabar institute of medical sciences (MIMS) Calicut and West Fort hospital Thrissur. Specialty Certificate in Gastroenterology, U.K.